Friday’s fourth quarter can essentially be summed up in one simple phrase, with credit given where due to Lemony Snicket: It was just one large series of unfortunate events. When the final 12 minutes began with Artesia holding a 23-point lead and having just forced Hobbs’s fifth turnover on downs of the night, most sports pundits in the state were already declaring a solid Week-Two turnaround for the Bulldogs. But there are some things in life that defy logic. Momentum is one of them. The ‘Dogs were unable to break free of their own red zone in their first possession of the fourth, but a punt was no cause for alarm, particularly with the Orange Crush defense having dominated the majority of the contest. But the Eagles got one of those perfect jumps on the snap that perhaps happens once in 50 tries. The immediate result was a blocked punt and a touchdown. The long-term effect would prove devastating for the Bulldogs. The score lit a sudden fire under Hobbs that spread as quickly as any other in the desert. And before the ‘Dogs could regain their bearings, the Eagles had mounted a 28-point comeback, literally snatching a 42-37 victory from the jaws of defeat. “Consistency was our focus going into the game, and we didn’t quite hit it,” Artesia head coach Rex Henderson said Saturday. “We did, more or less, for three quarters, but in the fourth quarter, we didn’t respond well to Hobbs taking the momentum. 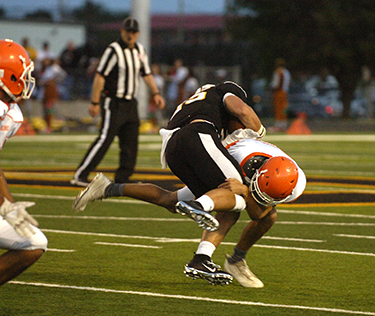 Artesia had no time to take a breath between the punt block and the Eagles’ next strike, as Hobbs’s Michael Cantu snagged Trent Taylor’s first pass attempt from scrimmage and took it 20 yards the other way for a second score a mere five seconds after the first. That cut the Bulldogs’ lead to eight with an eternity left on the clock. Visibly pressing on their next drive, Artesia was able to secure a first down on a holding penalty but went nowhere from there, and Taylor went down hard on a third-down sack. This time, the punt was clean; the return, however, was not, and a personal foul on the ‘Dogs handed Hobbs a start from the Artesia 36-yard line. Three yards later, sophomore quarterback Jarren Lewis – playing in place of the Eagles’ own injured starting QB – would find Se’Maj Cotton for a 33-yard score that brought Hobbs within two, 37-35, following the missed conversion attempt. With 7:34 on the clock, Artesia’s junior QB, Clay Houghtaling, took the field and proceeded to haul the boys in orange into Hobbs territory on a pair of runs, the second culminating in a personal foul on the Eagles. A 27-yard catch-and-run to Jagger Donaghe produced a first down at the 11, but following an illegal shift flag and a sack, Artesia was forced to try a field goal, which sailed wide right. Two plays later, Hobbs was back in the end zone on a 77-yard bomb from Lewis to Cotton. Down by five, the Bulldogs were presented with essentially the perfect comeback scenario with 3:32 on the clock, and following a 22-yard pass from a re-entered Taylor to Alex Fernandez and a 12-yarder to AJ Estrada, it looked as though they were poised to capitalize. But Donaghe was nabbed for a loss of three at midfield, and a trio of incomplete passes comprised a turnover on downs. It was a maddening end to what had been an overall solid game for the ‘Dogs to that point. The overall stats tell the story of another game that got away. 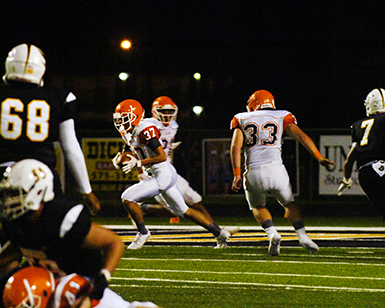 Artesia finished with 403 yards of offense and had produced points in all three quarters leading up to the fourth. There, they failed to move the ball past their own 30 until their final two drives, the stalling of which appeared to have nerves as a major contributing factor. Of the Eagles’ 470 yards, 255 came in the second half. Hobbs took a balance-by-halves approach to the contest, rushing for 200 yards and passing for just 15 in the opening 24 minutes, passing for 224 and rushing for 31 in the final quarters. Prior to the fourth, the Crush had limited the Eagles to just two touchdowns, forcing five turnovers on downs, three punts, and one interception. 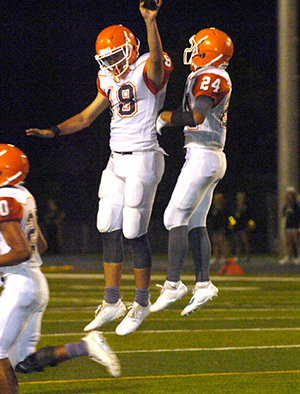 All total on the game, the Artesia defense gave up only four scores. Artesia’s offense got off to a bit of a shaky start in the contest, stalling in the red zone and settling for a field goal after starting the game’s opening drive at the Hobbs 32, then twice going three and out after the Eagles’ inaugural touchdown, an 80-yard run by Isaiah Vaughn. The ‘Dogs’ first series of the second quarter ended in a pick, but after the Crush forced a Hobbs three-and-out, the offense finally synced up for a seven-play, 55-yard touchdown drive that culminated in a two-yard plunge by JR Bustamante to make it 9-7 Artesia with 4:41 left in the half. 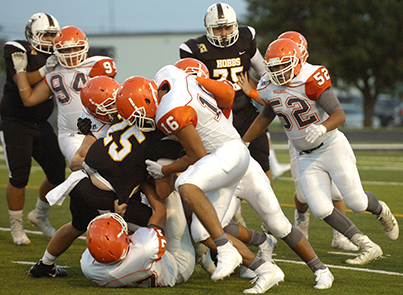 Hobbs responded quickly, needing just three plays from the Artesia 49 to find the end zone on a five-yard pass from Lewis to Jaime Rivera, but the Bulldogs would reclaim the lead just before the half on five-yard touchdown run by Taylor that made it 16-14. The Bulldogs’ defense came out with renewed physicality to start the second half, forcing back-to-back turnovers on downs, and Artesia made the Eagles pay for both, scoring on a 20-yard pass from Taylor to Bustamante and a 61-yard catch-and-run from the senior to speedy Erik Cueto that made it 30-14 with 7:53 left in the third. 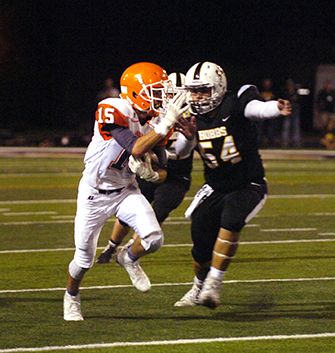 An Alex Harmon interception in the Artesia red zone staved off an Eagle charge, and Hobbs was forced to punt away their penultimate possession of the third from their own 20, giving the ‘Dogs a short field and – unfortunately – what would turn out to be their final touchdown of the night, a 13-yard pass from Taylor to Bustamante. Bustamante finished with seven catches for 77 yards and two scores on the night, and Taylor was 22 of 42 for 298 yards and three touchdowns. “Offensively, where we struggled was adjusting during the play to the things Hobbs did differently than what we’d practiced,” said Henderson. “As far as the things we knew they were going to do, you saw through three quarters that we were in pretty good shape. But as they adapted, we didn’t make the jump. Watching a win slip away via an opponents’ fourth-quarter rally for the second week in a row was a bitter pill to swallow for the Bulldogs, but Henderson is confident his team is learning from its mistakes. “We’ve just got to keep getting better every we,” said the coach. “We’ve gone up against two good 6A teams, two teams that it’s really important to them to beat Artesia. And we should’ve won both of them. Not that you take moral victories out of that, but I think the kids have been able to see in both games where, if they’d done certain things better, they’d have won the game. Their upcoming contest will be a significant one for the ‘Dogs, as they return home to host a rematch of the 2017 Class 5A state championship game against Belen. The Eagles currently stand at 2-0 with wins over Del Norte (40-21) and Farmington (26-12). “On the whole, we’ve played good football for most of two games now, and that’s what we’re trying to show these guys – this is the type of football team you are when everybody works together and we do things like we’re supposed to,” Henderson said. “We move the football, we stop people, we have success.